New opportunities for the waste and recycling industry are being opened in Poland thanks to economic growth and major investments in construction projects, according to Danish recycling equipment manufacturer, Eldan Recycling. According to the company inquiries show that an increasing number of companies want a piece of the valuable “recycling cake”. “The past five years we have noticed a steady increase in requests from Poland” commented Toni Reftman managing director at Eldan Recycling. “Within cable recycling we have noticed an increase in both quotes and orders for small and medium capacity systems, as well as for solutions for further recovery of fine copper from insulation. However, he said that Eldan is now being contacted by investors looking for equipment in those areas, as well as others such as the production of Residual Derived Fuel [RDF] and aluminium scrap processing. 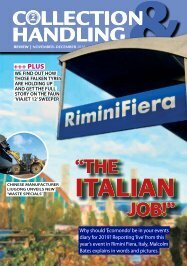 Processing of Off The Road (OTR) tyres was also said to be generating more interest than in the past years. 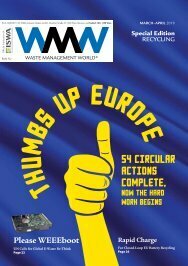 “The recycling industry in Poland is certainly blooming!” he concluded. Danish recycling equipment manufacturer, Eldan Recycling is to supply a three tonne per hour cable recycling line to Chinese firm, Tianjin Xinneng Renewable Resources. An agricultural waste tyre collection event at the Cecil County Central Landfill in Elkton, Maryland, saw over 9500 scrap tyres weighing an estimated 259 tons (234 metric tonnes) collected from 80 Cecil County farmers.